Many images here begin with the natural world and end in a human gesture of freedom, of release. 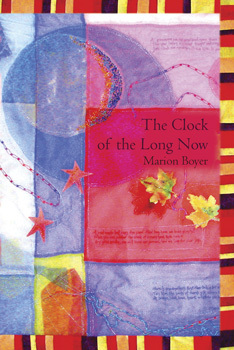 Marion Boyer creates a world of imagination. She goes as far as to create a character, Jake, whose life unfolds in the pages of this book. Boyer’s elegance ruminates throughout the lyric in these poems. Read a review of The Clock of the Long Now at 360 Main Street. to his bones, eyes like pepper. A sonofabitch at capping blow-outs. says the valley still echoes in his long ears. asking, knowing the steam will prop you up. it would look something like her hands. her way and she touched her hair. Marion Boyer is a professor emeritus from Kalamazoo Valley Community College where she taught communication. Boyer’s poetry and essays have appeared in numerous literary journals and magazines. One of her poems was nominated for the Pushcart Prize in 2007 and she won first place in Rhino’s 2006 poetry competition. She received another first place award in the 2008 international competition sponsored by the Science Fiction Poetry Association. Her chapbook, Green (2003), is available from Finishing Line Press. Boyer lives in Mattawan among Michigan’s vineyards and orchards and credits her poetry success to her wonderful Kalamazoo writing groups and countless cups of strong English tea.